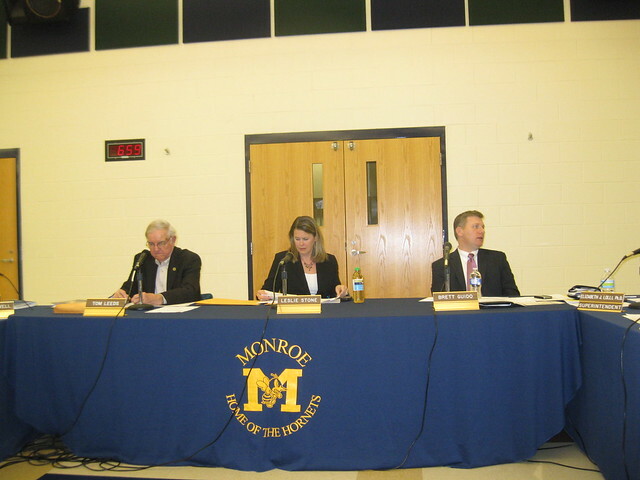 Despite the $2.2 Million in cuts (mostly from 19 teachers and school employees being cut), without new money the Monroe school district will be unable to submit a financial plan that would satisfy the Ohio Department of Education. There isn't enough projected cash flow to sustain the district with its projected $4.5 Million deficit. Even a levy can not fix the shortfall quickly enough to avoid fiscal emergency according to at least one school board member. The school board will be forced to pass a resolution stating that the district is unable to propose a satisfactory plan and request to be placed in fiscal emergency. When the Monroe School District is placed in fiscal emergency, a financial planning and supervision commission will be appointed to oversee the district and adopt a financial recovery plan. The commission will be made up of people from the state and Monroe citizens. Coincidentally, the City of Monroe applied for fiscal emergency status in 2004 and was removed from fiscal emergency by the state in 2007. Monroe local schools will likely be in Fiscal Emergency for a longer period due to the severity of the school district's financial problem. It took Southern Local in Meigs County 9.4 years to get out of Fiscal Emergency; it took East Cleveland City Schools 8.2 years, and East Liverpool City in Columbiana County 5.3 years. Monroe School district will refinance or restructure operating debt and will remain in emergency for the duration of the repayment period.